If you’ve been around drums and the drum community long enough you will hear all about The Moeller Method. It’s almost as famed and revered as the drummers who have used it. Players like Dave Weckl, Jojo Mayer, Jim Chapin, Dom Famularo, and Ralph Humphrey have applied this technique to develop incredible speed, power, fluidity and musicianship. The Moeller Method is the brainchild of Sanford A. Moeller, who described the technique after observing the way Civil War drummers struck the drum in the late 1800s. He outlined the system in his book The Art of Snare Drumming, also called The Moeller Book. He later taught the system to Jim Chapin who worked to popularize this method until his death in 2009. 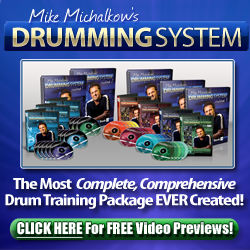 The Moeller method is a technique that uses a whip motion and makes use of the rebound that the drum produces allowing you to play with greater relaxation, speed and power. You strike the drum with a downstroke, let the stick rebound and then let the stick bounce on the upstroke. As you can see you get multiple hits for the price of one and greatly improve economy of motion. Here’s some more benefits of The Moeller Method. Practicing The Moeller Technique will help to develop your awareness and the feel for your sticks. You learn how to grip your drum sticks properly, how to strike the drum properly and how to let the stick rebound properly. This unique approach will enable you to get maximum bounce and control from your strokes. Once you have discovered the proper way to hold your drumsticks and strike the drum, you will notice something – you are far more powerful. You can hit the drum with the same amount of effort but produce a much bigger sound. With this technique, you will be able to get the most power out of each stroke with very little work at all. Probably one of the biggest benefits you will see from The Moeller Method is the increased speed. The Moeller Method teaches you how to use the rebound of your stick to control the amount of strokes you get from each hit. When you have the technique mastered, you will be able to get anywhere from 2 to 6 (or more) strokes for each hit of the drum. You can only imagine how much faster you could drum with the ability to get 4 times the amount of strokes from your basic drum roll. By letting the stick bounce freely instead of mashing it into the drum you will find that you produce a much larger and brighter sound from the drums. The drum heads are able to resonate fully and fill the room the way they are supposed to. Whether or not you decide to fully integrate The Moeller Method into your everyday playing is up to you but at least work with it in the practice room for a while. The increased control, power and endurance are definitely worth the investment in time. If you would like to learn more about The Moeller Method and how to develop it then check out Mike Michalkow’s Moeller Method Secrets. It’s a great teaching disc that will improve your speed, power and control around the drumset. Buy It Here.